This recipe was developed two weeks ago using two types of ricotta I bought at the supermarket out of curiosity. There were two small packages of ricotta, one sheep and the other goat. Their flavor is much stronger than cow’s milk ricotta, so I thought I’d make them the principal ingredients in my quiche, while the tomatoes serve as decoration. 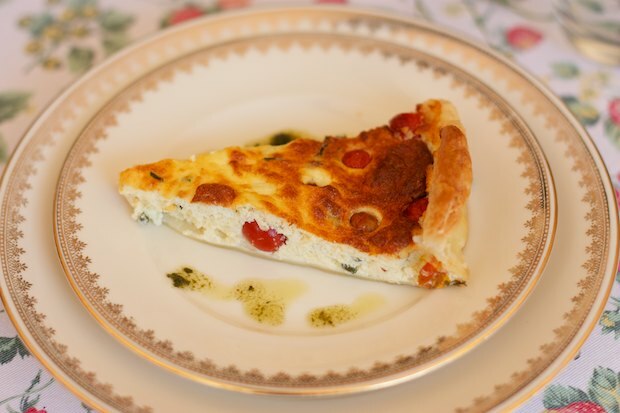 This quiche was served as an appetizer at an outdoor dinner with some relatives who came from Marche in central Italy. For the American recipe, I’ve suggested cow’s milk ricotta, since it is more readily available. Wash and dry the tomatoes, cut the mozzarella into small cubes, and chop the chives. In a bowl, add the ricotta and mix it with a wooden spoon then add the egg yolks. Pour the egg whites into a high bowl and beat them until they are very firm with an electric whisk. Grease a spring form pan and line it with puff pastry dough. Pour in the filling and place the tomatoes here and there, taking care to leave some on the surface. 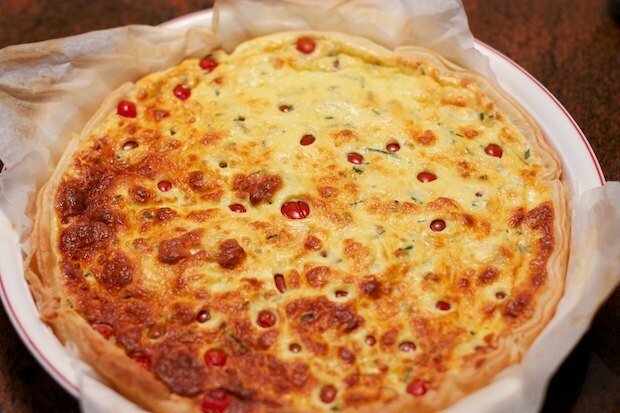 Put the quiche in the oven then turn down the temperature to 350°F and bake for 40 minutes. Serve as an appetizer with a bit of basil oil in very small portions. If it is your principle dish, you may cut bigger slices. Posted in Eggs and tagged with Tomato Quiche, Torta Salata ai Pomodorini. RSS 2.0 feed.